One of the perks of living on top of a hill is the view. It (almost) makes up for the extra wind. I can see across the Wyoming prairie for miles up here. If you ever want to know what kind of weather’s coming this way, call me. Several weeks ago I was busying myself in the kitchen, preparing to tackle my To-Do List, when I happened to look out through the kitchen window. 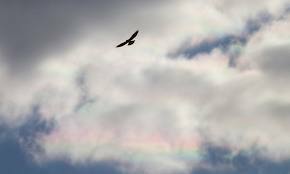 There, perfectly framed and silhouetted against the backdrop of the gray sky, was a gliding hawk. I sensed the quiet nudging of the Holy Spirit. Stop. Watch. I have something to teach you. So I abandoned my list, picked up my cup of tea and took my perch at the window. As I observed the hawk in flight, I was mainly struck with how little he flapped his wings to stay aloft. Every now and then he’d flap a few times to maintain his position and height, but the rest of the time he’d merely spread his massive wings and let the wind do the work. It appeared effortless. So not like me, I thought. I guess I’m a flapping bird. I have so much to do. Flap, flap. I must pursue my agenda for the day. Flap, flap, flap. I will wear myself out trying to make it all happen. Cease striving and come to Me. Relax and let Me carry you to heights your feeble self-effort could never reach. Abandon your fleshly agendas and allow the mighty wind of My Spirit to direct and empower you. I created you to Soar. Like the hawk, I want to flap less, and soar more. To be emptied of my lesser agendas. Freed from my exhausting efforts. Filled with His Holy Spirit. God can change me from a flapper to a soarer. Because, yes. Yes we are! *From “How Birds Fly,” www.learner.org. Rain, rain. Go away. Come again another…month. Seriously. We’ve already broken the local record for precipitation in the month of September. And if the raindrops that pelted my bedroom window again this past Monday afternoon were any indication, we are well on our way to shattering the all-time record. Newsflash: We are no longer in a drought. Across town many folks are repairing flooded basements and drivers are dodging a plethora of new potholes. But this is nothing compared to the devastation suffered by our Colorado neighbors just to the south. They were inundated with more than twice the amount of rain we received. We join them as they mourn their losses and pray for them as they set out on the long road of recovery. Our pastor’s basement was one of the unfortunate casualties here. Last Sunday morning it was filling up so rapidly they put out a distress call. At one point they had no less than NINE Shop-Vacs going, just to keep their knees above water. The sodden ground was so saturated that the water was coming in through their foundation. There was just nowhere else for it to go. After nearly a week of steady rain, our normally arid plains had surely become saturated. The soil was like a water-logged sponge, unable to absorb another drop. The excess had to go somewhere. So it is with our spiritual lives. 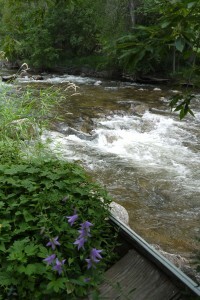 Throughout Scripture, water is used as a metaphor for the Holy Spirit’s filling and empowering. I’d sure like those words to characterize my life. I do believe in Jesus. And I have known what it is like to be propelled by His invigorating, energizing power. But without the Spirit’s continual filling, I shrivel up like a crusty old sponge. The abundant rainfall this month has done more than just bring our area out of a persistent state of drought. It has also served as a timely visual aid to me, a reminder of what my life in the Spirit should be. Saturated with His Word. Soaked in His presence. Filled to the brim with His Spirit. Flowing over and out into the empty places around me. Living Water, flow in me. Flood each thirsty pore with your refreshing presence and sustaining power. Flush out the clogs of self and the debris of sin so that the river of Your Spirit can run free and unhindered through me. Fill me up, I pray. May my mind be so steeped in Your truth, my heart so saturated with Your love, that I have no other recourse but to spill out, overflowing to a world in need. In Jesus’ name, Amen. 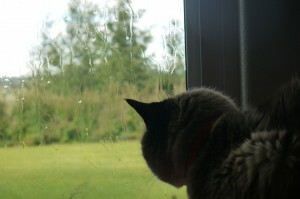 Photo Notes: Top photo was taken of our cat looking on as more rain fell on Monday. Bottom photo was taken while we were up in Boulder Canyon on August 31, 2013, just a week and a half before the flooding.